When I bought this book, I was seriously confused by the other book The Art and Flair of Mary Blair: An Appreciation that was also coming out in the same month. Magic Color Flair is actually the companion book to the exhibition of the same name that's held at The Walt Disney Family Museum from March 13 to September 7, 2014. This book is a 176-page hardcover. The focus of this book is on the aesthetics of Mary Blair's art and design. 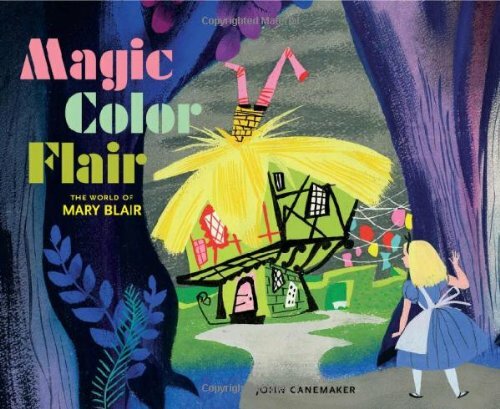 The essay by John Canemaker reflects that, and if you have The Art and Flair of Mary Blair as well, you will find that there is quite an overlap of content. To get a fuller picture of Mary Blair's life, you have to get the other book. Mary Blair's artworks are wonderfully produced in the book. They are printed huge, many are printed full page. They included artworks that she created for Disney and for her freelance jobs. You'll see art for Cinderella, Peter Pan, Alice in Wonderland, "It's a Small World" exhibition and the Little Golden Books. This is a fine artbook by itself. But if you just want to get one book, I would suggest getting The Art and Flair of Mary Blair: An Appreciation. I feel that the selection of works is much better in the other book which are more striking and representative of Mary Blair, but that could be because I read that book first. There aren't much duplication in both books so you can still get both, but then there's this dissatisfaction of having to pay more money just to have a more complete collection.